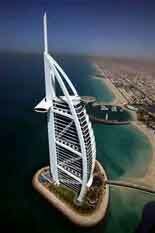 Hotels in Doha are luxurious world class. All hotels have airconditioning. Doha Qatar is a must of a business trip to Arabian Gulf states. I lived in Doha in 1984. My good friends, brothers Sheikh Mohammed and Sheikh Nasa live in Doha. The hospitality of the people including my students at QGPC was very welcoming and generous. The hotels in Doha are world class. Nearly all hotels in Doha are new. Photo of Sheraton Hotel Doha Qatar. 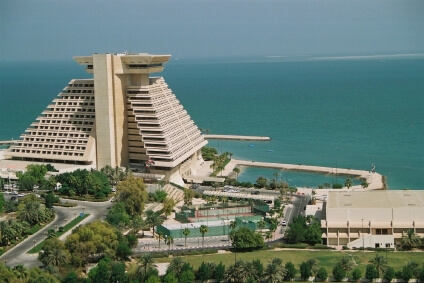 I spent many hours sailing in the bay near this Doha Seraton Hotel. Restaurants high in the Hotel Sheraton Doha have good views of the Doha Bay. Qatar has the world's largest natural gas reserve. With a small population, per capita income is very high. Your trip to Doha should not be all business. Your hotel in Doha can book fishing trips out into the Gulf, Golf, Desert 4 wheel driving, Tous of Doha. Some of the best SCUB diving in the world is not far from your Doha hotel. Free and interesting activity in Doha is a walk along the Doha Cornish but do it at sunset with your camera when it's cool. Summer temperatures in Doha can get over 50 degrees celcious. That's why all hotels in Doha have air conditioning and most hotels in Doha have nice large swimming pools.